As the popular notion goes, men are definitely from Mars (the passionate planet), so are the Women from Venus, the love planet. A nature's most wonderful creation, a girl loves unconditionally and her love is forever. She can love like there is no tomorrow and hate like you wish you would die. As solid and patient as earth, she can be a protector, a healer a creator and a destroyer. Proposing a girl can certainly be a bit tricky but not impossible. 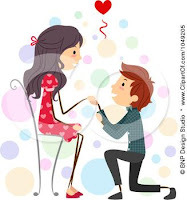 So guys if you are sailing in the confused boat unaware of the way to propose a girl, look out at the following tips to get ideas on how to propose her and be hers forever. We wish you all the best! Do a little homework. Get to know your girl well, before you pop the question. Get to know her interests, her dislikes, and her general nature that will help you plan your proposal in a better way. If she is shy and an introvert, propose when you two are alone. If she is sporty and loves adventure, then take her for rock climbing and propose when you reach at the top. The age old way of going down on knees in public is still the best way to propose a girl. Don’t try this idea with a shy and introvert girl as she might find it difficult to reciprocate as it could be embarrassing. Words matter a lot to girls if said genuinely or else they can easily figure out the topping of gloss you have added and will be unaffected. If you can write well, write a poem for her and record it in a CD. Play it while you are together and see her melting. All girls love flowers. So get a huge bouquet of roses and tell her how much you love her and how much she means to you. Tell her you would like to spend the rest of your life with her or alone. Be ready to be smothered by a genuinely happy woman's hug! Gestures have a great role to play in proposing a girl as they take a quick notice of it. Show your gentle, protective and emotional dependence nature while you are around her and mean it too. Girls fall for guys with these qualities and there will be no ground for rejection when you will propose her. Appreciate her for what she is. Tell her "you look beautiful" when she does not have any make up on. Tell her she looks amazing when she is having a bad day and mean it. She will love you for it and will readily agree when you propose. Just don't overdo it, as it will look fake. Girls love to be pampered so when you intend to propose, make sure you are chivalrous enough to make her feel special and at the same time not look vulnerable. Women want a strong man, not a wimp. You can even propose the girl at a place where you first met or a place you have fond memories of as these places have an association attached to it that will give less chance to her for refusal. Don't force her to say yes. The worst you can do is to push her around and threaten her dignity. Tell her to take her time and that you shall wait. Be a gentleman and respect her. Incase she doesn't want a relationship; she will let you know of it then and there.